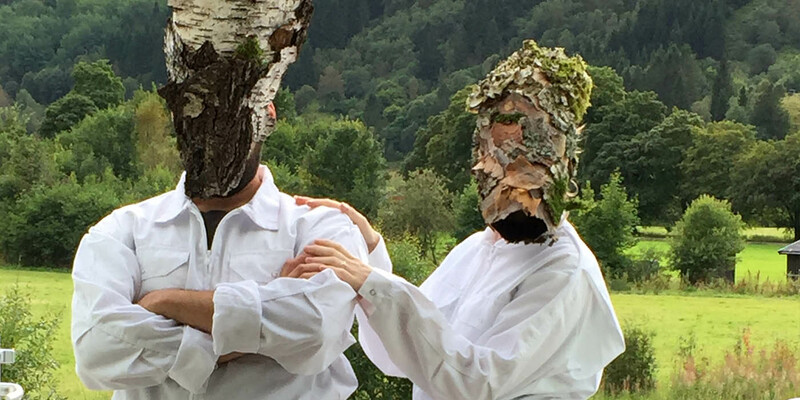 Meet Norwegian environmentalist and philosopher Arne Næss in a performance based on spiritistic and shamanistic rituals. Arne Næss is known as the father of Deep ecology. He realized this strict but loving philosophy at his remote mountain cabin Tvergastein. In order to experience this philosophy Ludvig Uhlbors gathered a multi-disciplinary team of artists and moved into Arne’s cabin. Is it possible for anyone to live like Arne? Can a lifestyle like Arne’s provide us with new perspectives in a time of climate change? The experiment was more successful than expected. The philosopher was resurrected and began to possess the bodies of the ensemble. When the team later were invited to the Theatre festival in Fjaler they felt that the only logical thing to do was to start a cult. The goal of the cult was to expand concurrent perspectives on life in accordance with Arne’s ideas, that our empathy must encompass predators, ticks and plants. That the things we normally perceive as dead; minerals and formations, are also manifestations of life. Now Arne and his friends from the other side has directed the ensemble to pay a visit to Malmö. Ludvig Uhlbors (SE/NO) is a Swedish playwright and director living and working in Oslo. From 2006 to 2009 he was part of the artisitc direction for Malmö based theatre group Institutet.